More from my studious husband…. Here’s another contribution to my analyses of the CrossFit Open competition, and is continued from here, where I looked broadly at maximum and minimum placings among Open competitors, and here, where I examined the frequency that athletes finished within the top 60 of a given Open workout and how that related to qualification for Regionals. This particular post is an extention of my brief analysis examining probabilities of Regional qualification with top 50 finishes during the Open. This post attempts to address (2): your chances of qualifying for Regionals with a particularly high Open placing. I’m going to refer to “maximum placing” again, which seemed to cause some confusion in my past posts. Maximum is highest absolute value. For instance, 398th is a higher place than 2nd place. So, “maximum” is “bad” if you’re interested in competing. I’ve got plots to present, and I will summarize them in the last paragraph of this post. So you’re interested in qualifying for Regionals, but 14.3 is a culmination of all of your weaknesses: triple-under, backflip, muscle-ups, while holding a perfect D-flat major. You compete, and finish as expect, but not to your liking. Do you still have a chance at qualifying? Fig. 1: Regional qualification (1 = Yes, 0 = No) of athletes with increasing maximum placings in a given open. 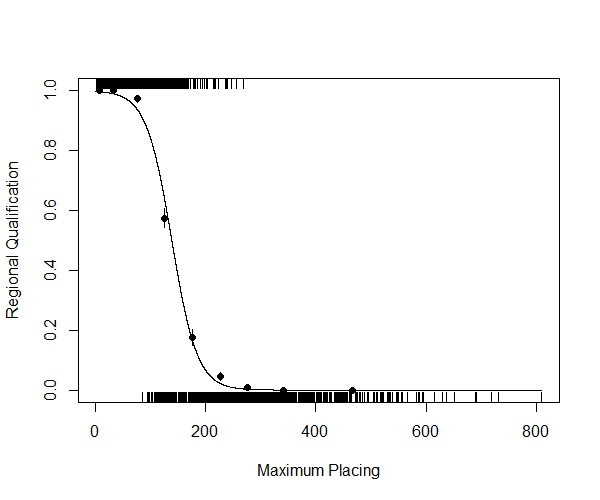 The line represents a generalized linear model fitted to binomial qualification data, and predicted with maximum placings. Closed points are empirical probabilities with standard error. 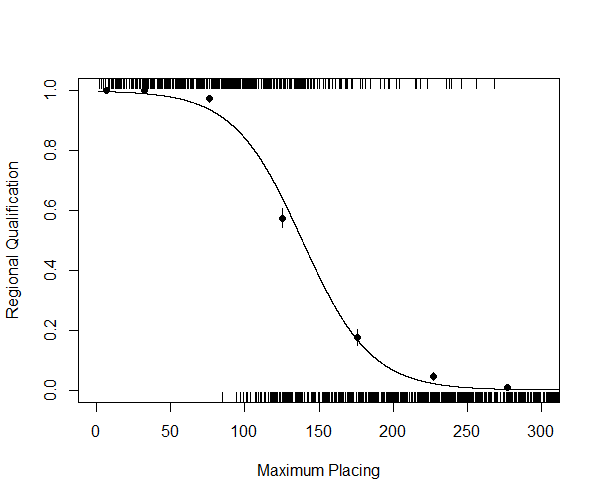 Figure 1 is similar to what I presented in my previous post, but the x-axis has been replaced with Maximum Placing – the highest place value (remember, high is ‘bad’) an athlete received during a given Open competition. Each little, vertical line represents one athlete, during one Open competition (1800 total), and it is placed on the bottom (y = 0) for non-regional qualifiers, and on the top (y = 1) for the Regional qualifiers. Where each line is along the x-axis represents her maximum placing of the five workouts in a given Open. Fig. 2: A modified scaling of Figure 1 – the x-axis has been limited to < 350. 0.09 % by the time we reach a maximum of 300th place. This is exactly what I found in my first post – get a score above 300th place and you’ll be breaking records if you qualify for Regionals. I need to emphasize the limits of my dataset. These ‘probabilities’ are not actually probabilities (more accurately, they are estimates of the contribution of maximum placing to regional qualification taken from fitted models to past data), and they only apply if you happen to be a women, in one of the five regions listed in the first post… during Open years 2012 and 2013.